It wasn’t easy to impress Captain Fred Stott. He was a man of the world. Educated at the prestigious Philips Academy and Amherst College, he knew enough history, biology, and civics to spend two years teaching before joining the service. Since OCS, he’d added an impressive list of credentials to his record: machine gun platoon leader, an infantry-tank liaison, a rifle company executive officer, and now a company commander. He’d witnessed countless acts of bravery, and contributed his own to receive a Navy Cross. And he’d countless tragedies, losing more friends than he cared to count. He could rub shoulders with battalion commanders, or run up against them when his “Fireball” personality got the better of his tact. A gifted writer, he constantly took mental notes of what he heard, saw, and experienced, in preparation for future publications. He seemed to have an opinion, an explanation, or a rationalization for everything he saw – and he had seen a lot in the last two years. Yet one brief period seemed to catch him off guard. The experience of going into reserve on Iwo Jima was, he found, simply beyond belief. For three unbelievable days and nights we rested in reserve. It was unbelievable because all former reserve experience on Saipan and Tinian was temporary, and we would be fortunate to remain so situated for one full day. To be in reserve was unbelievable, because the preceding week had been unbelievable as well. The First Battalion, 24th Marines fought longer battles in more grueling climates, but a single week on Iwo dealt them casualties that were, in Corporal Alva Perry’s words, “awesome.” Almost 900 of them had landed on February 19; today they could count 629 ready for duty, and of these 31 had already been wounded, treated, and returned to duty. Never had the battalion taken so many losses in so short a time, and while other units had suffered more, the experience was an unprecedented physical and mental trauma for which there was no quick cure. At 0900 on February 26, 1/24 left the blockhouses and moved to an assembly area in TA 165 E. The men knew that this respite might end at any time – it would prove to be the last they received for the duration of the battle – and they made the most of their reprieve while it lasted. The recently vacated, pre-dug foxholes were pleasant. We were plentifully supplied with water for washing, drinking, and even shaving, and with quantities of appetizing “10 in 1” rations. We lazed around, ate, slept, ducked an occasional sniper bullet…. They dropped their gear in foxholes, shedding combat packs and webbing with sighs of relief. Habit and necessity convinced them to carry their weapons at all times; helmets were worn, aching feet remained in reeking boondockers. They cleaned weapons, then themselves. The more fastidious washed faces, hands, and scrounged for toothbrushes; others didn’t bother, rationalizing that they all smelled the same, anyway. A few passed out and slept, dead to the world. And the rest realized just how hungry they were. Exhausted Marines from 1/24 enjoy “a quiet moment” on Iwo. The man at front right is sound asleep. Photo courtesy of John C. Pope. Marines make donuts in a makeshift kitchen on Iwo Jima. Date unknown. 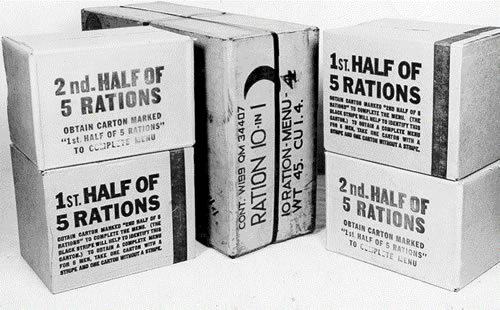 With the gustatory bar set to this uninspired height, any change in diet was a welcome one – so First Battalion’s chowhounds perked up when they saw the bulky, heavy cardboard boxes labeled “RATION 10 IN 1.” Originally created for tankers and mechanized infantry (the fifty pound boxes required vehicles to transport any great distance), the “10-in-1” was intended to feed ten men for one day, or one man for ten days. Connoisseurs of K-rations were impressed with the planned menus for breakfast, dinner, and supper – and by the variety of tinned foods they dug from the boxes. Although first introduced in 1943, the 10-in-1 evidently did not reach 1/24 until Iwo Jima. They were an immediate hit. “A 10-in-1 is enough to feed a whole squad,” explained Al Perry. “It was loaded with good things. My favorite was a large can of uncooked bacon.” He joined the handful of foxhole chefs learning to prepare their own meals. • Open can of bacon with can opener or, if impatient, with bayonet. Remove bacon and set aside. • Find or borrow a “handful” of C4 explosive. Place the C4 in an empty C-ration can. • Light, very gingerly, with the matches included in your 10-in-1 ration. • Place bacon in flattened tin skillet, and place skillet over the burning C4. • Make sure nobody knocks over your stove. • Cook for ten minutes. Captain Joe Swoyer dishes out hot food on Iwo. He described the meal as “pineapple and turkey” – where he got the ingredients is not known. USMC photo. “Chow down on Iwo Jima.” These 1/24 Marines have found some “10-in-1” rations. Photo from John C. Pope. Mail arrives on Iwo Jima. USMC photo. “Mail call, Iwo.” Few things brought joy like letters from home. Photo courtesy of John Pope. Being in reserve was restful, but one was never completely at ease. Iwo Jima is often described as a battlefield with no rear area, and for good reason. Japanese troops hid in bypassed bunkers, waiting for a good target or for the day their food and water ran out, at which point they opened fire. General Kuribayashi’s subterranean tunnel network had countless entrances and exits; try as they might, Marine demolition teams couldn’t find and seal them all. At night, raiding parties emerged to steal supplies, kill Marines, or both. PFC William Quinn swore he could hear someone digging beneath his foxhole around the clock. “My foxhole buddy and I were deciding, when he breaks through, who’s going to drop the first grenade?” Quinn recalled. Luckily, “he never did get through.” The battalion took daily steps to counter this problem, starting immediately upon arrival at their rest area. A combat patrol was sent to the Boat Basin; after investigating some rusted Japanese barges, the patrol reported all clear. We went down and we each picked up two five-gallon cans of water. I’m carrying a carbine, and I put it on my shoulder – of course the thing would be sliding down. So I unbuttoned the flap [on his combat jacket] and I put the sling underneath and buttoned it down. Now how stupid could you be? The Japanese, they had spider traps and stuff—they could come up out of the ground from anyplace and be behind you. What would have happened if they had popped up? I couldn’t have fired a shot. I could have thrown water on ‘em maybe…. That sounds ‘rear echelon,’ but we had to get the water back and I was having trouble keeping that rifle handy so I buttoned her down. Boy, I never did that again. Bill Quinn and his buddies had a close call courtesy of a skilled Japanese observer. They were at loose ends, with “no leadership, no communications, just sitting in these big foxholes.” One of them – an amateur golfing champion – produced a golf ball from deep within his pack. He was sitting in the biggest sand trap of his life, but still scooped out a little hole, found a stick, and took a few practice putts. Suddenly, everyone wanted a turn. “We were gonna have a contest,” related Quinn. “The battle’s going on while we’re doing this. We’re seventeen, eighteen, twenty years old – what did we know?” Unfortunately, one killjoy Japanese observer spotted the tournament and sent over a dozen mortar shells. “Missed all of us, but it almost got the gunny sergeant. The Gunny was sitting in the gun position, and the mortar came right over his head, went into the embankment, but didn’t explode.” Gunny Lohff was “a little irate” and swore unspeakable vengeance if he saw the golf ball again. “We knew what he was gonna do with it!” Quinn laughed. Of course, where there was combat, there were casualties. Shells felled a few men, sending them to the hospital with blast concussion or shrapnel wounds. A few others went down for untreated diseases, or for complications from earlier wounds. And two Able Company men lost their lives. The first was the company commander, Major William K. Stewart, who succumbed to wounds suffered on February 25. The other was Private William W. Knicely, the company’s barber. Although a Marine since 1939, Knicely was in combat for the first time. He had served as a cook for a Parris Island defense battalion; when his unit left for the Pacific, Knicely and a handful of others decided not to make the trip. After six months on the lam, Knicely was apprehended and was charged with desertion in time of war. Whatever defense he offered failed to impress the judge, and Knicely was stripped of his rank and sentenced to several years in Portsmouth Naval Prison. Baker Capt. William A. Eddy, Jr. The respite also gave the battalion a chance to reorganize. Wounded leaders needed to be replaced; depleted squads and platoons needed to bolster their numbers. Unfortunately, few of the details were recorded for posterity. On 27 February, 2Lt. Charles R. Anderson Jr. transferred from Charlie to Baker Company, presumably taking command of one of Captain Eddy’s rifle platoons. All of the battalion’s companies had lost at least one officer; some platoons were being led by NCOs. In addition to the inter-company shuffling, a handful of men rejoined the battalion. These Marines had been wounded or fell sick in the first week of the battle; their ailments had been treated in the rear, and they were now judged well enough to return to the battle. However, welcome as they were, they were not enough to rebuild the battalion to fighting strength. Cpl. Hasara returned from hospital, and 2Lt. Anderson was transferred, on 27 February, 1945. All other events occurred on 26 February. Towards the end of February, groups of bewildered-looking men began reporting to the combat units. They were comparatively clean, fresh-faced children or somber older men. They bunched together, or wandered out into the open. They handled their weapons without confidence or enthusiasm. Sandy Stott, excerpt from “Looking Back at War and Life: Fred Stott, ’36,” Andover Magazine, Fall 2011, 23. Digital edition. Lt. Stott evidently argued with a superior officer, telling the man he was unfit for command. He spent four days in the brig, but avoided formal charges thanks to his performance in the Marianas campaigns. 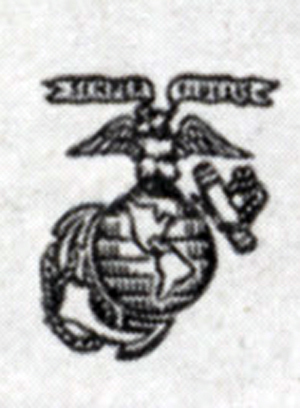 Stott penned at least two works that were published during the war years: “Saipan Under Fire,” and “Ten Days on Iwo Jima,” which appeared in Leatherneck magazine. Frederic A. Stott, “Ten Days on Iwo Jima,” Leatherneck Vol. 28, No. 5 (May, 1945); 18. Original landing strength, by this author’s count, was 893. Accounting for the battalion’s daily casualties is more difficult than might be expected. This article uses two main sources: the regimental after action report, and the battalion’s own muster rolls. While the muster rolls count time from midnight one day to midnight the next, the regimental report counts from 1800 hours one day to 1800 the next—thus, a man wounded and evacuated at 2100 hours on February 21 would be counted as D+3 by the battalion, and D+4 by the regiment. Daily counts on this website are based on the battalion muster roll. John C. Pope, Angel On My Shoulder, Kindle edition, locations 1509-1511. Interestingly, a former Charlie Company cook named Peter Kakadelis recalled making donuts on Iwo Jima, and that the smell was so enticing that he had to have guards posted around his kitchen. Unfortunately for 1/24, Kakadelis had been transferred out of their unit, and the fruits of his labors went to his new buddies in I/3/14. Alva Perry, “The Men Of ‘A’ Company,” 2011. Mike Mervosh, oral history interview conducted by The National World War II Museum, “Oral History Part 2,” March 19, 2008. Colonel Walter I. Jordan, Annex George to Fourth Marine Division Report on Iwo Jima: RCT 24 Report (2o April, 1945), 32. Major Charles L. Banks, “Final Report on IWO JIMA Operation, Battalion Landing Team 1/24,” in Annex George to Fourth Marine Division Report on Iwo Jima: RCT 24 Report (2o April, 1945), 142. Hereafter “Final Report.” Toothbrushes, razors, and razorblades were in short supply. William T. Quinn, interview conducted by the Patriots Point Naval & Maritime Museum, “Heroes of Iwo Jima: 70 Years Later,” 5 March 2015. Bill Crozier and Steve Schild, “Uncommon Valor: Three Winona Marines at Iwo Jima,” Winona Post, 25 October 2006. Online edition. Col. Joseph H. Alexander, USMC (Ret. ), “Iwo Jima: Hell With The Fire Out,” Leatherneck vol. 78, no. 2 (February 1995), 17. Quinn, oral history interview. The battalion’s AAR for February 27 notes “late in the day a few heavy enemy mortars landed nearby.” That a few shells merited reporting gives a good indication of the relative quiet. Knicely died en route to Saipan; he was buried in a cemetery there on March 4, 1945.